So, what's this camping lark, then? Good question. Actually, it all started in 1980, after a disastrous holiday in Blackpool. My mother decided that the idea my grandparents have of a holiday is no good. 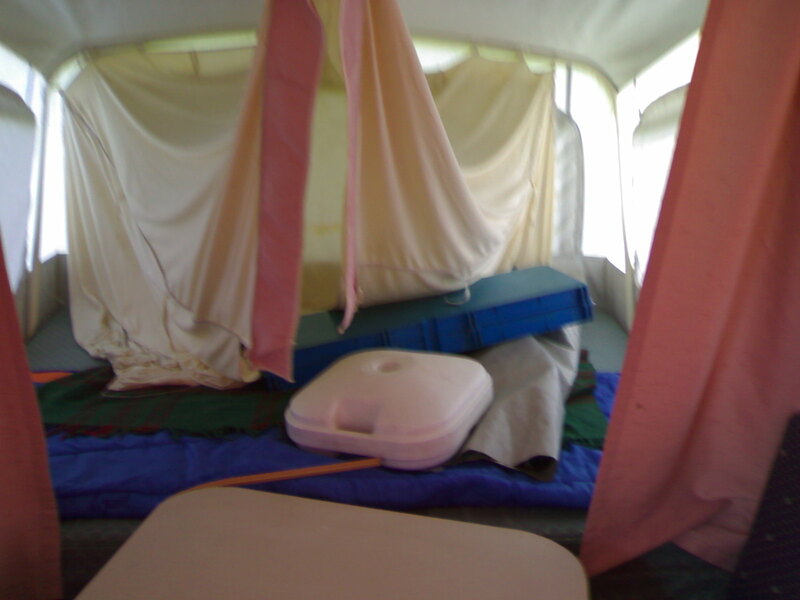 Therefore, one muddy October half-term, we cleared off to Malvern in a tent. After Easter at Llanystumdwy, and a short break at Hereford Racecourse, we spent the summer in Scotland, visiting Moffat and Edinburgh, then finally spent a week in the north-east of England. 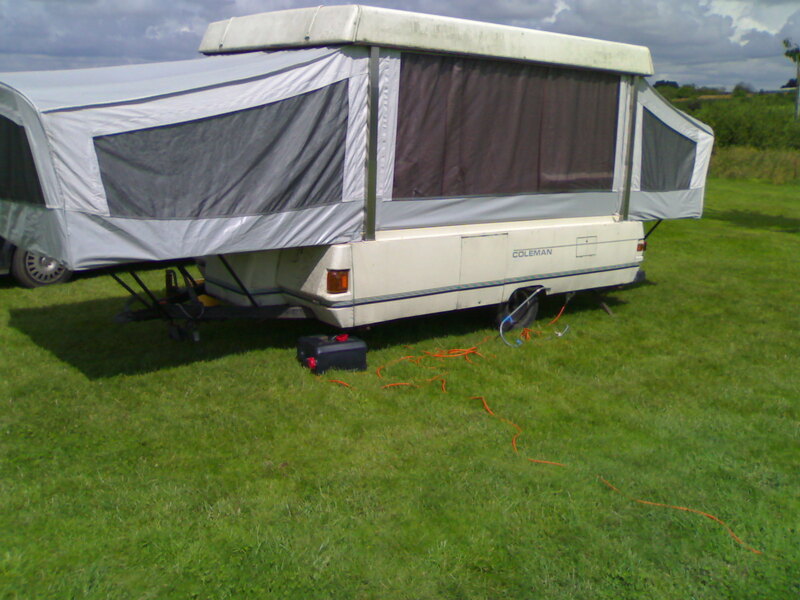 The camping continued, and in 1983, we got a trailer-tent. A what? I hear you cry. 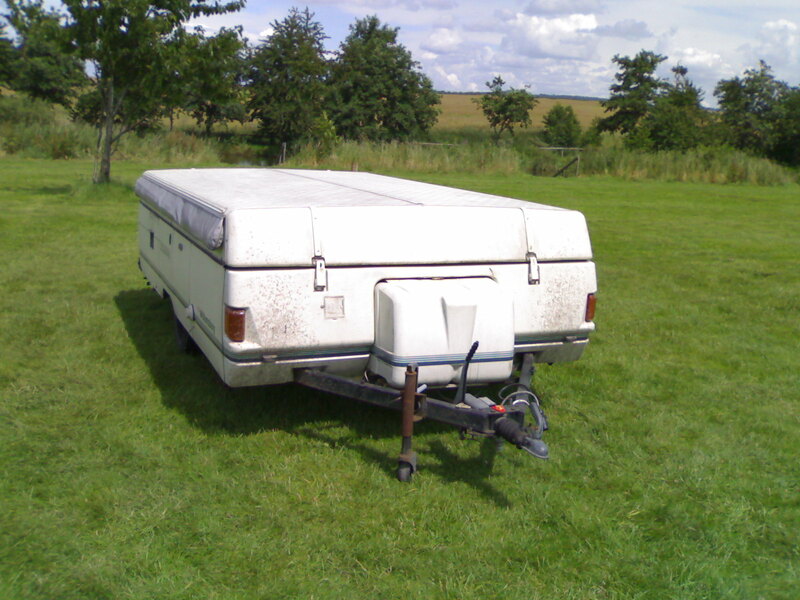 A trailer-tent. I still hope to put a picture of a trailer tent here soon. My parents had two trailer tents, a Concraft Rancher and a Conway Cruiser dating from the time when that was a trailer tent. I also had a Conway Calypso for a while. 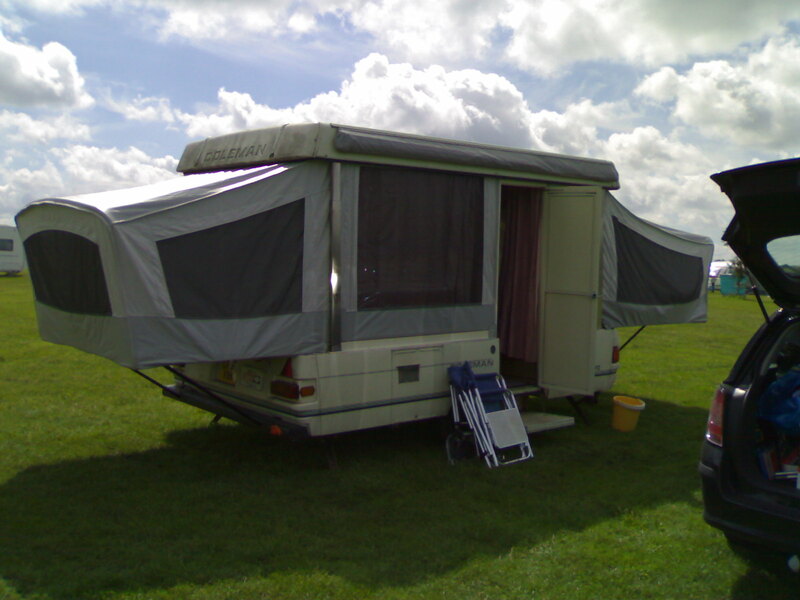 There is a related kind of unit called a folding camper – my parents had four of these, two Pennine Aztecs and two Colemans, a Sun Valley and a Williamsburg. I now have the Williamsburg and am getting on with setting it up to my liking. My sister currently has a Dandy, so you can guess we're still at it. I have been asked by a friend, and I was intending to do this anyway, to show some photos of the Williamsburg. As with all my pictures, you can click them to get the full size versions. Apologies for the blur on some of them – I haven't quite mastered getting rid of the shake on the mobile phone yet. 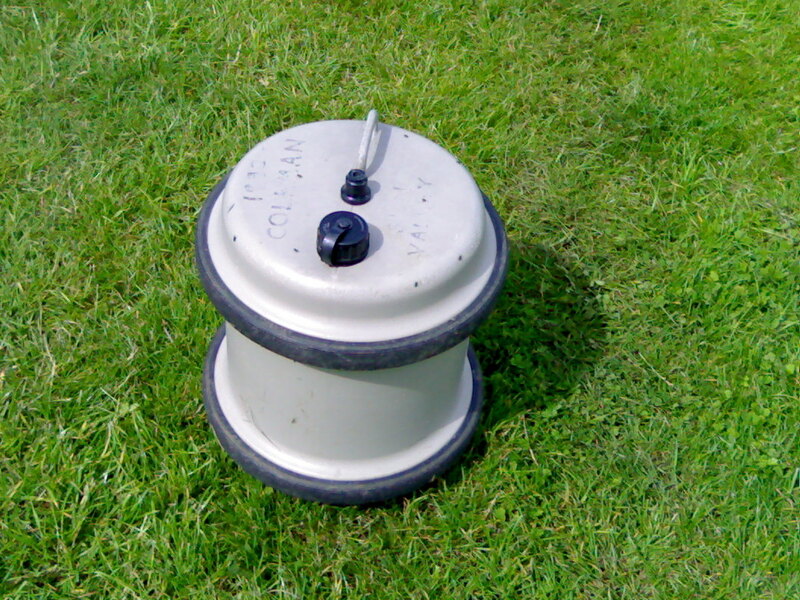 Round the back (nearside when towed) of the unit, the waste tank which is used on pitches without a drain can be seen, along with the mains lead and Aquaroll handle. 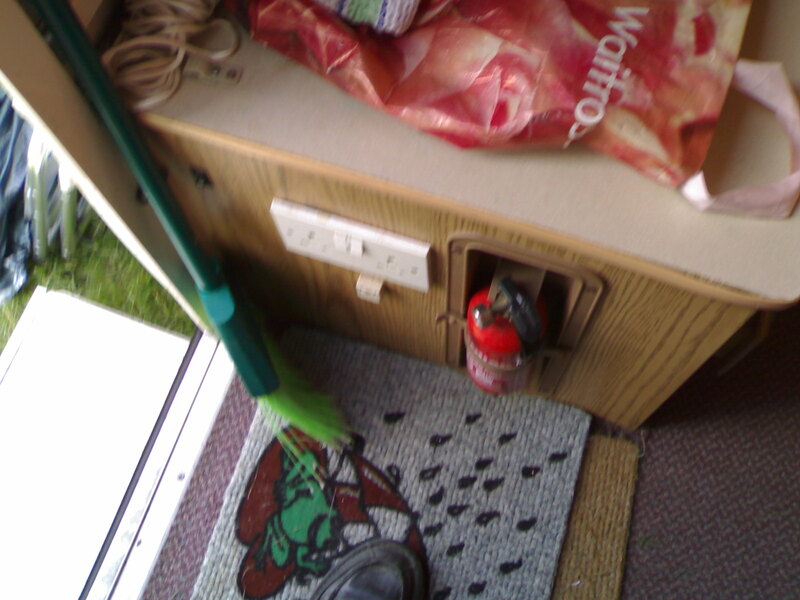 There is a cupboard on the unit which can be accessed from the outside, even with the unit closed. This is the flap. On units with a built-in fridge, it replaces this cupboard, but I don't know of any Colemans with built-in fridges in the UK. 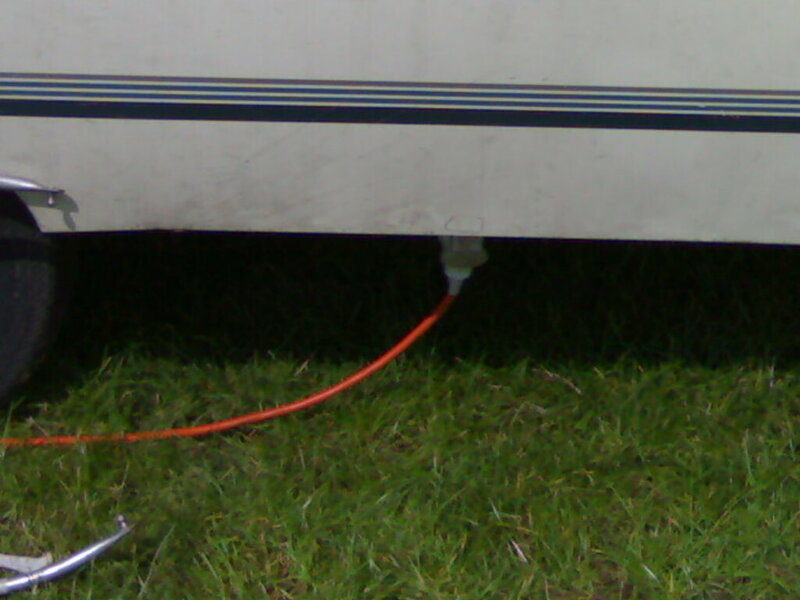 Mains water can be connected to the unit on suitably equipped pitches, but if not, it is possible to put water into a tank in the unit. This can be put in using a portable water pump and a suitable water transporter, such as an Aquaroll. In either case, the water is connected or added behind this small flap. Where the pitch has mains electricity, we can connect to it - it can supply all the power needs, for small mains devices and those which are designed for 12V DC. Where this is not supplied, we can use a battery or a connection to the car for the 12V DC parts, and if we require a small amount of 230V AC, we can run a generator, though that can be noisy. 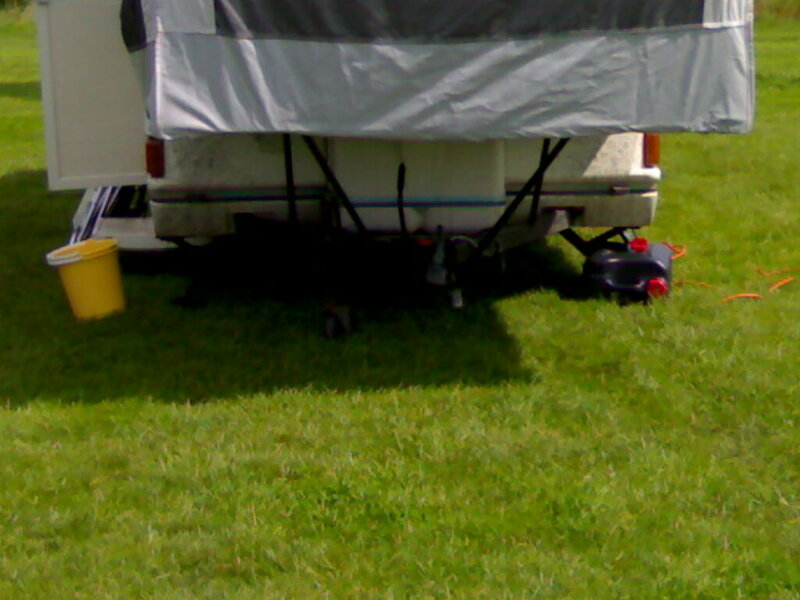 Under the hitch end is the gas locker - it holds two 3.9 kilogram propane cylinders. These are used to run the stove, heater and boiler. The changeover was originally manual but an automatic one has now been fitted. It is under this end that we connect a battery if we are on a site with neither mains water to the pitch nor mains electricity. Without one of these, water will not run from the taps, so connecting electricity in some form is usually essential. For completeness, the space under the spare bed at the back of the unit is usable on site for storage. However, there is nothing to connect there - the only feature is the aerial for the built-in radio. However, this does not merit a photo. To get water into the unit if we are on a pitch without its own tap, we pump it into the onboard water tank from an Aquaroll, a 29 litre polythene barrel. The handle seen earlier makes it easy to move, as it does not have to be lifted when full. 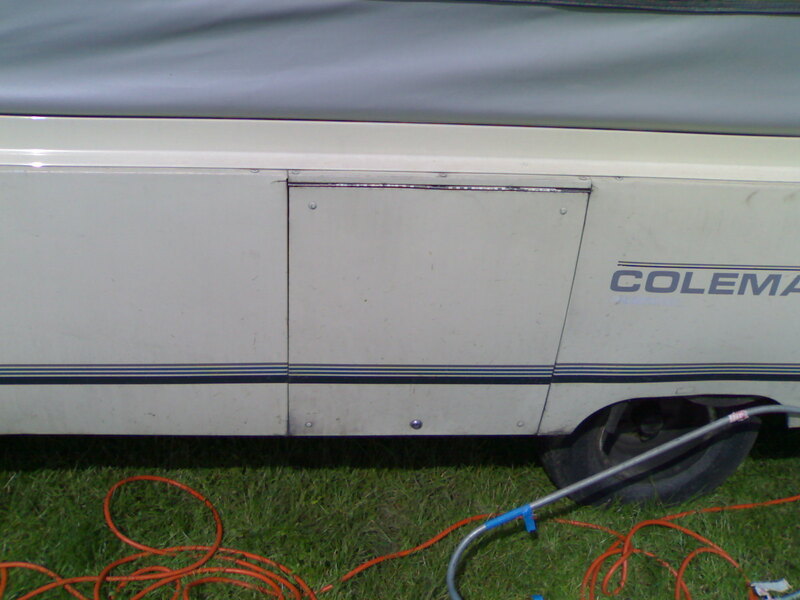 The text on it indicates "1990 COLEMAN SUN VALLEY" - this one came with my parents' previous unit. 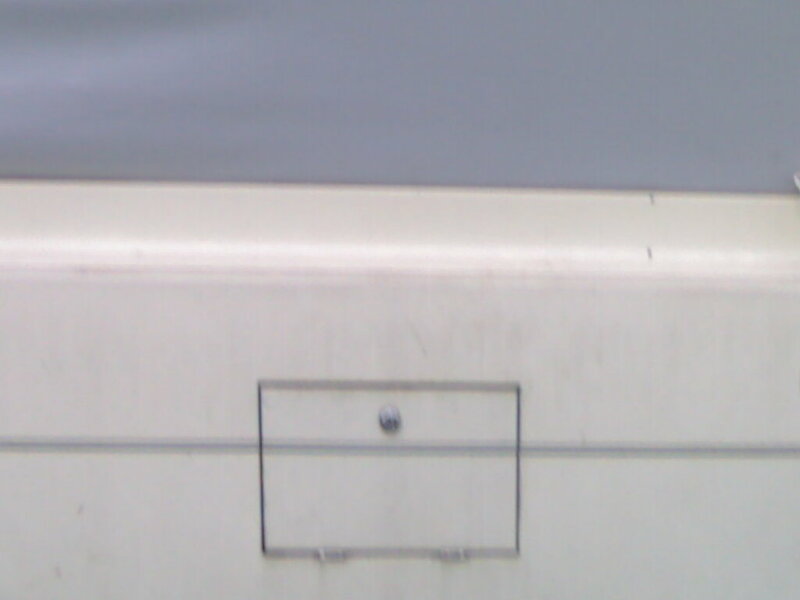 It is not a standard feature, but this was part of the identifying marks added by its original owner. 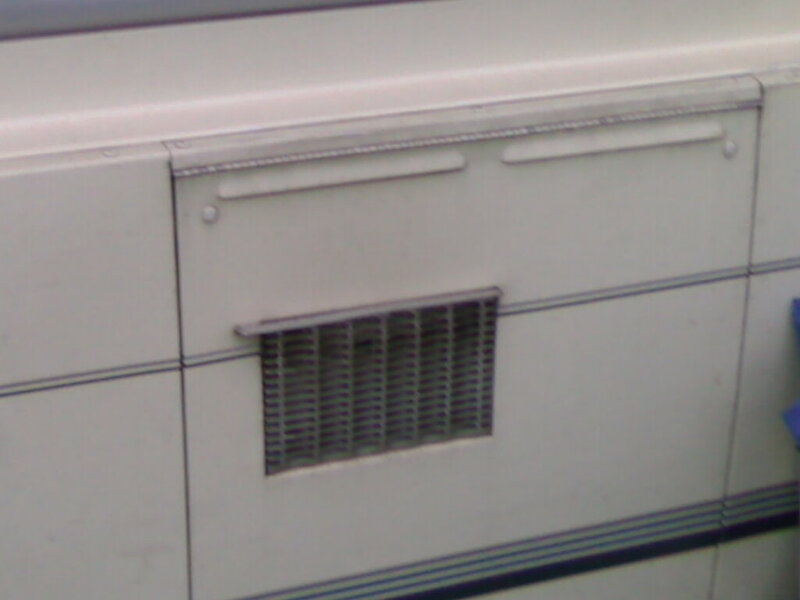 As well as a tank onboard to hold the cold water, on the other side of the unit is a boiler. 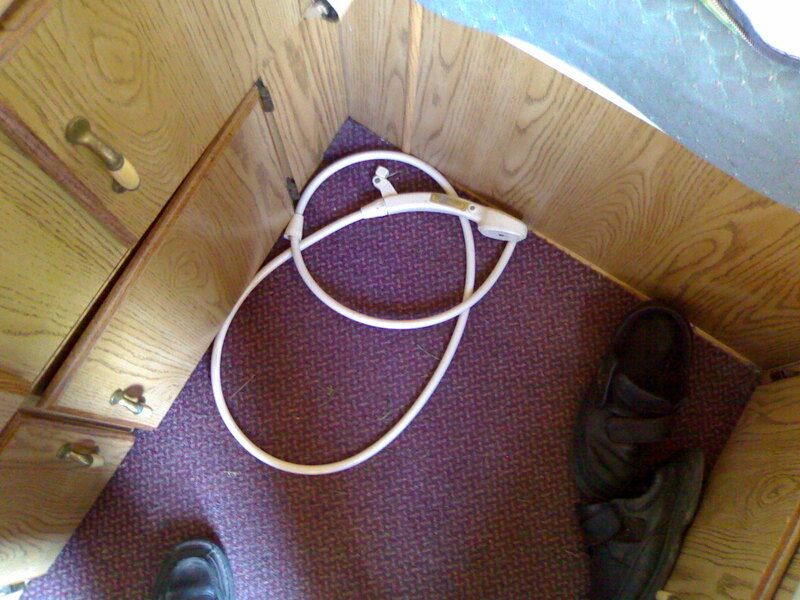 This allows, when lit and working properly, the hot taps on the unit to actually run hot. It depends only on water and gas - on a pitch with mains water it will work with the electricity off. The boiler is located behind this door. And so to the inside. The cabin has a queen size bed at one end, and a double at the other. We use the double to store items - either those we have not yet found a use for or those which need to be out of the way during the day. As a result, we do not often put the bed roof/wall liner in place at this end. The middle part consists of a dining area with two bench seats and a table. 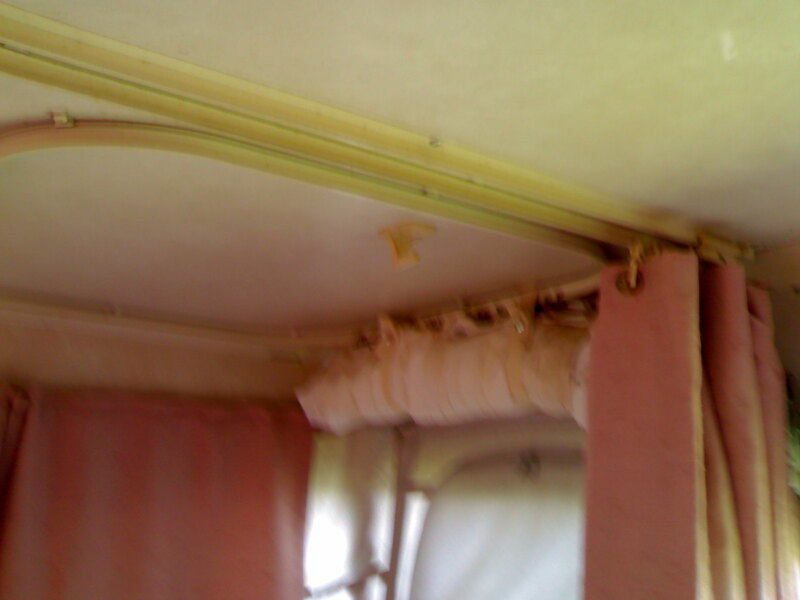 Storage is available under the seats but there is less than might be expected due to the water tank, boiler and heater which are also fitted in the space. 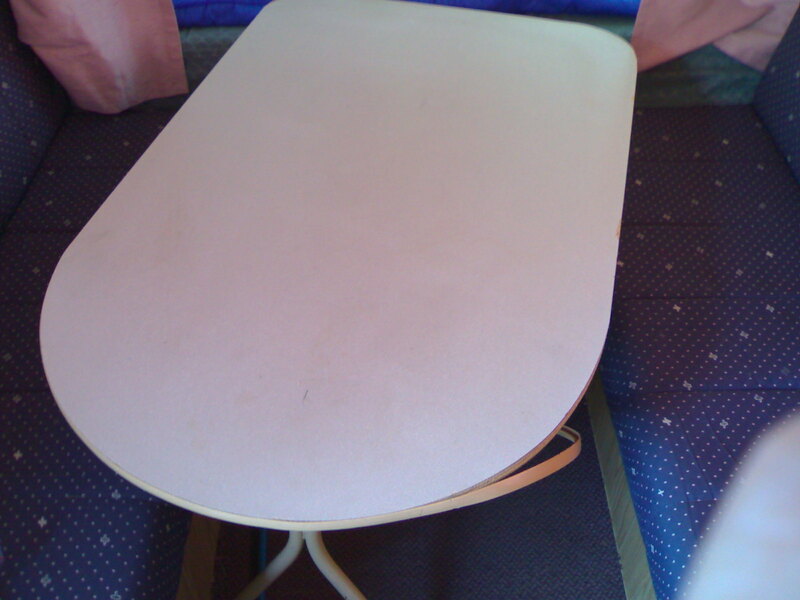 At the time of this photo, the table was in need of a repair which could not be completed in the time we had available on site. 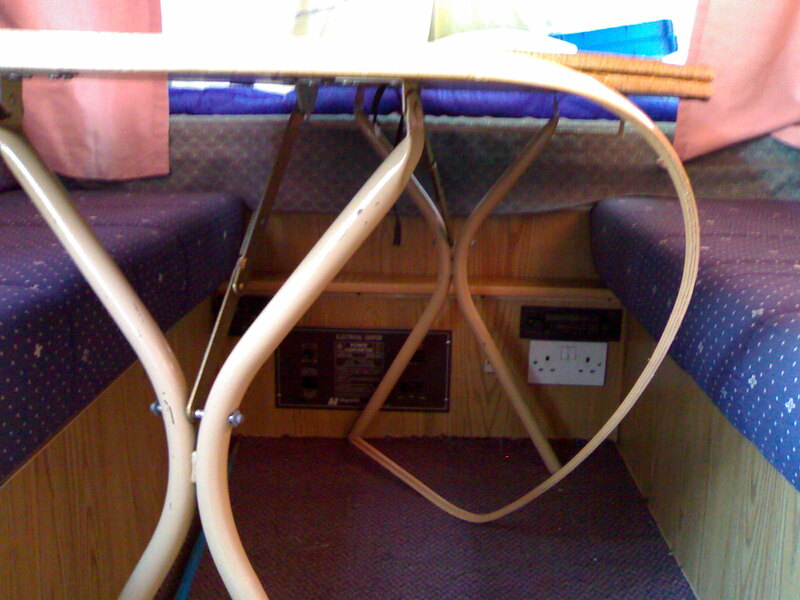 The electrical panel, radio and heater controls are on the end wall under the table. The electrical panel converts the 230V AC into 12V DC, or allows us to switch the battery in. The radio does not work well on mains power at present, but the heater can be difficult to light on battery power - it uses a spark to light the gas and fans to move the air around. There are also Type G mains sockets and a 12V 10A socket there - for plugging in such devices as we may wish to use. The mains sockets will only work when a 230V AC supply is used, but the 12V socket works whenever that or a battery is used. 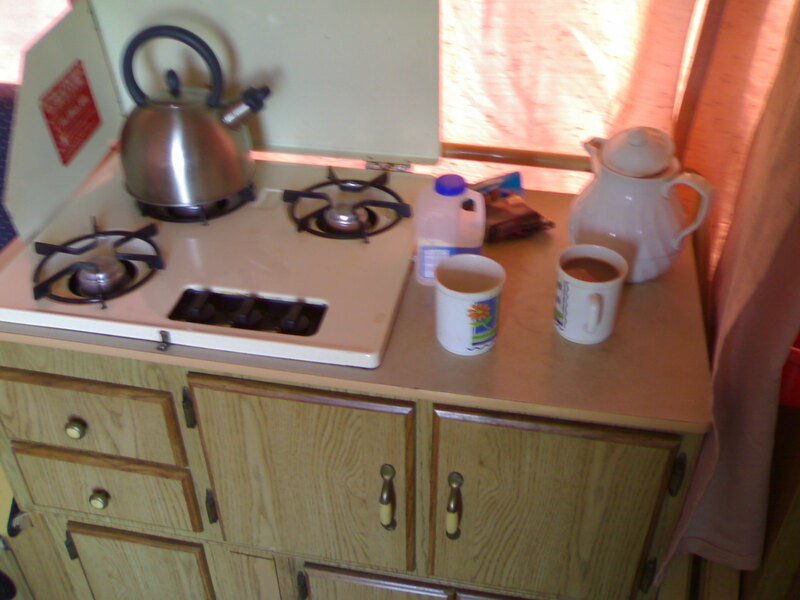 The kitchen has a three burner stove - no grill but we can get round that by the use of a stove-top toaster or other cooking methods. Drawers and a cupboard are mounted below the stove. 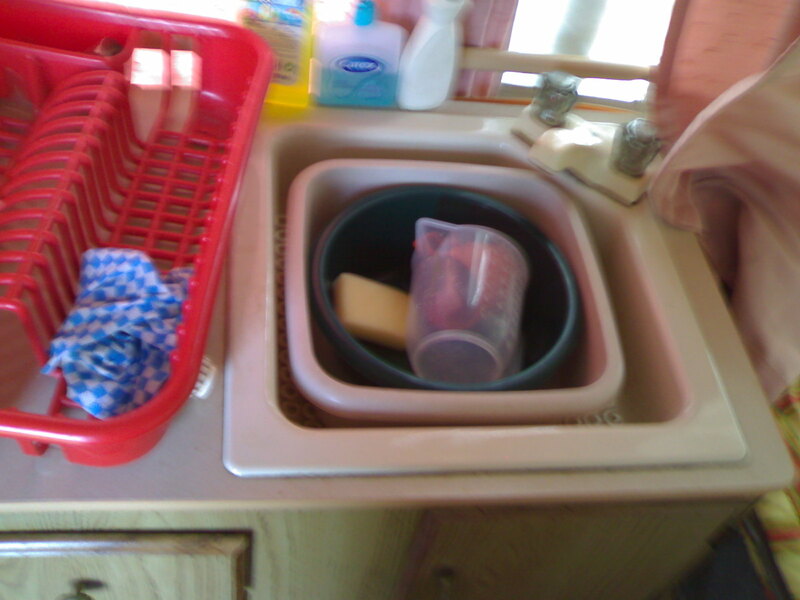 ... and of course it has a kitchen sink. Running cold (if mains water is present or the electricity is on) and hot (if the boiler is also lit) water are available. 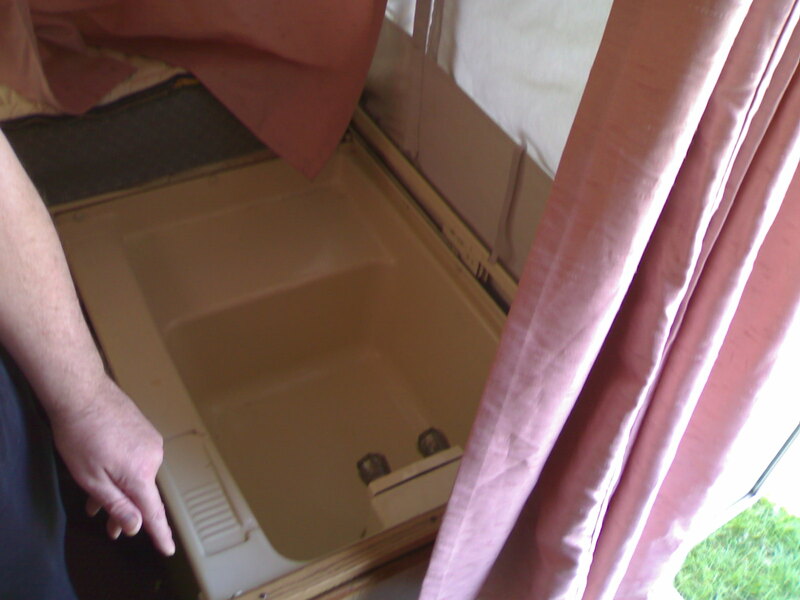 The sink drains through a fitting under the trailer, into the tank shown earlier, or on a pitch with its own drain, a hose directed straight down the drain can be used. It is the only sink, so is also used as a bathroom sink. We have a mirror/rack board we can hang above it when needed. Once again, two drawers and a cupboard complete the unit. The unit has a small bath/shower tub as well - once again, running hot and cold water are available. This drains through an outlet on the front of the unit. Unless there is a drain at the pitch, someone needs to be on hand to change the buckets as needed. When not in use, the tub can have a cushion placed on it, thereby providing an extra seat. Of course, on a site with suitable facilities, this might not get used, but on sites not suitably equipped, it is a definite plus point. The showerhead can be hung on this hook, but I find that inconvenient and would rather hold it. The shower curtain is rolled up - in use, it would of course be lowered. The showerhead screws on to the threaded outlet of the mixer tap in the bath. There is a flow control button on it, making it possible to stop the flow and leave the taps on. Four further type G power points are available - two in the kitchen area and two just inside the door. This area is also home to the fire extinguisher and an additional 12V 10A socket - the only problem being that it is on the fridge circuit and does nothing on site, though a minor alteration to the battery lead would sort that. (The grey pouch contains a sun canopy.) After that, all that remains is to attach it to the car, secure the jockey wheel, release the brakes and check the lights. Once all that is done, it's time to hit the road. Of course, a lot of equipment has to go in the car, but this can be minimised if you know you don't need some of it for a particular trip. For instance, this trip to Pillaton Hall Farm near Penkridge did not require batteries or a generator, and we did not take the fridge either. However, on a low facilities site, or for a long trip, more will be needed. 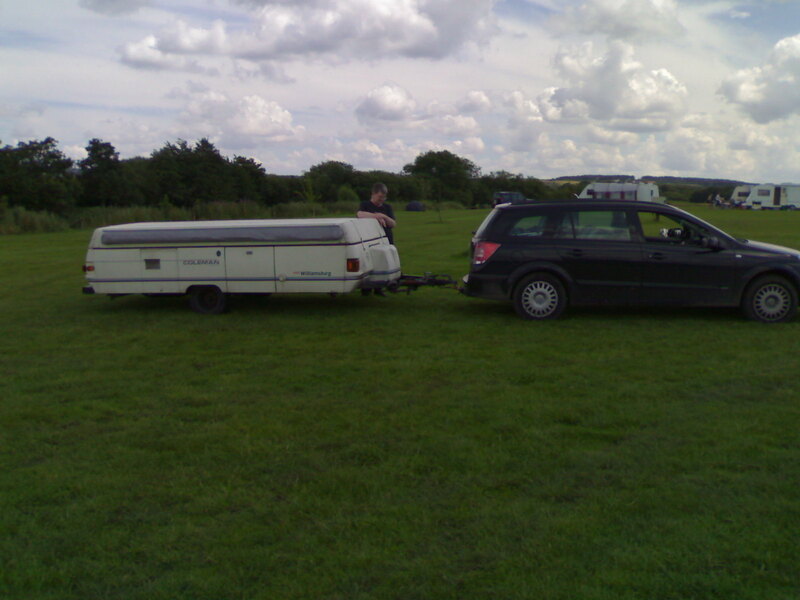 Regrettably, we had to give up camping, at least of the self-pitched kind, in May 2011. We arrived at Birthday Meet (a day late due to traffic problems) and I found it very hard going to set the unit up – partly because of a strong wind, not that much could be done about that, and partly because of back pain. As I continued setting up, I also discovered a lot of damage done by mice – coupled with everything else, it was just too much. I am very pleased, though, that my sister decided to take the Williamsburg. She has cleaned it and put it right and is enjoying using it when she can. 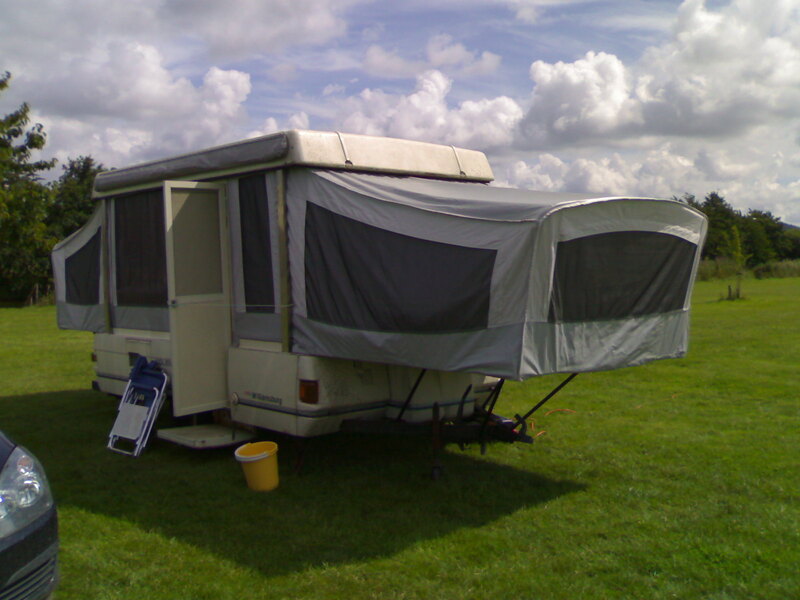 We will be taking self-catering accommodation – ready-pitched camping included – for holidays from now on.